Will Asus successfully undercut Samsung? There's nothing better than a bit of healthy competition, and Asus jumped ahead of Samsung's Galaxy Note 3 IFA reveal with its own 6-inch alternative - the Asus Fonepad Note 6. Don't get bogged down with the (typically) confusing Asus naming - this is more of a tablet and aims to mimic what Samsung has done with its own Note series. The Fonepad Note 6 is certainly strong on the specs. Inside is a dual-core Intel Atom Z2580 processor clocked at 2Ghz offering 2GB of RAM and running Android 4.2. There's also 16GB or 32GB of storage, with an 8MP camera on the rear and 1.2MP camera on the front. One of the first big positives to immediately stand out about the Note 6 is the sharpness of the screen. The full HD 1920 x 1080 Super IPS display makes the Note 6 nice and vibrant, especially noticeable during video playback. Like the HTC One, the Fonepad Note 6 also rocks stereo speakers on the front for a fuller, richer sound, although we'll have to wait until our full review to really test the quality here. From what we did see, we were happy enough. Asus is also slotting in an S Pen-like stylus that feels and acts almost identically to Samsung's. It even has its own version of Air View that lets you interact by hovering the pen above the screen. As soon as you take the stylus out of its slot holder it boots up the note-specific applications. We found that doodling on the Note 6 was smooth and accurate during our time with it although Asus is yet to confirm whether the tablet stylus has the same levels of pressure precision as the Galaxy Note 3. But the comparisons end when it comes to overall body design. At 10.3mm thick and weighing 210g, the Asus Fonepad Note 6 is bulkier than its Samsung rival and we found that holding it in one hand wasn't as comfortable, though still manageable. And while we think the black version looks nicer than the white, it also suffers from being eye-blindingly glossy, which only reflects the cheaper build quality here. With that in mind, we hope that Asus is planning a lower price point for the device, and so far all signs look good. For those who want to make use of the "Fone" side of things, the Note 6 comes with HSPA 3G and noise cancellation. 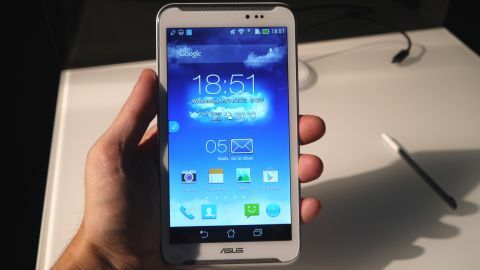 Asus takes a hefty swing at the Galaxy Note 3 but doesn't quite land a KO. The Padfone Note 6 is strong on the spec sheet but falls down in some of its mid-range design. Still, with a mid-range price to match we can see a lot of Samsung would-bes might be tempted over to the Asus side. We'll have to wait to put them head to head in our full reviews to know for sure.